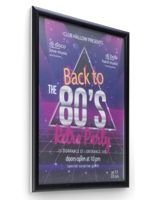 (2) poster frames give you multiple advertising options. Acrylic pocket adjusts to whatever level you need. Brushed aluminum frame fits with any setting. 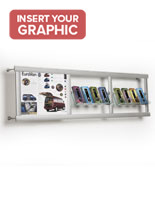 This pamphlet display is a perfect leaflet holder for areas where floor space is a concern. The leaflet holder features (2) poster frames. 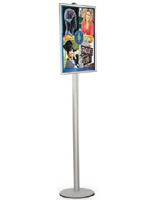 The leaflet holder also includes protective lenses to ensure your posters remain clean and undisturbed. Booklet displays, literature stands, and other leaflets holders have an acrylic pocket in the middle of the display to place your publications. The acrylic pocket is adjustable in both height and angle to suit any need. 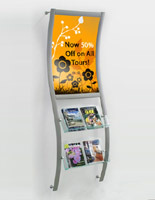 This magazine rack, leaflet holder is great for lobbies, welcome centers, and airport waiting areas. The pamphlet holder, leaflet holder has a brushed aluminum frame. 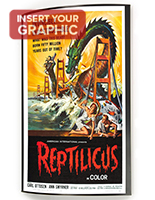 Durable and light, the brushed aluminum frame makes this leaflet holder perfect for high traffic areas. Brushed aluminum has a silver finish to easily match any environment. The leaflet holder with protective lenses is designed for indoor use only. 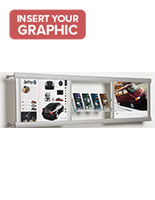 The leaflet holder, also known as a brochure display, fits (2) 24" x 18" graphics. No matter your business, this leaflet holder is sure to catch passersby's attention, and direct them to your pamphlets. Please Note: Graphic is not included with leaflet holder. 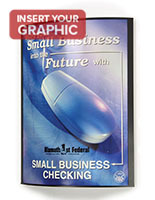 When designing your images, keep in mind actual graphic size is 24"w x 18"h, where 1/2" on each side is covered. 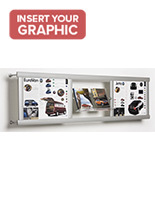 Your graphics should be printed on regular poster paper, so as to ensure they will fit securely within the grooves. This will not be a problem for any printing service facility.